While Vuzix is beefing up the processing power of its next-generation smartglasses with the Qualcomm Snapdragon XR1, the company will also give its devices an upgraded display engine. At the Augmented World Expo today, the smartglasses maker announced that it will pair its waveguide optics with Plessey Semiconductor's Quanta-Brite microLED light source built specifically for Vuzix. A company spokesperson confirmed that Quanta-Brite will be included in next-generation waveguide-based products, including the next version of the Blade smartglasses. 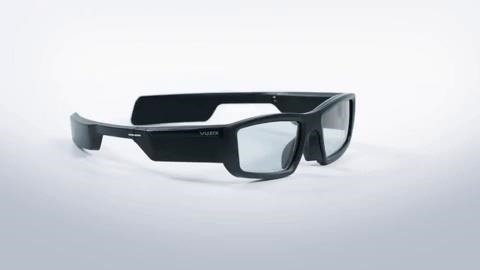 The combination cuts the size and weight of the optics system of Vuzix's wearables in half. Quanta-Brite also offers increased brightness output with improved battery efficiency and reduced cost and complexity of manufacturing. "Plessey's Quanta-Brite microLED technology can be a major enabler of the future of augmented reality," said Paul Travers, President and CEO of Vuzix, in a statement. "As well as delivering high-efficiency, low-power and small-size illumination capabilities, the very high level of luminescence of the Quanta-Brite light source can also enable the development of end products with a sleeker form factor, which is a key attribute of our waveguide based Smart Glasses and critical to mass market adoption." When combined with the powerful and efficient Snapdragon XR1, Vuzix expects better battery life and higher quality AR content for its next wave of smartglasses. Likewise, the newer components will contribute to a slimmer form factor. To achieve improved energy efficiency and light output in a smaller footprint, Plessey uses a proprietary gallium-nitride-on-silicon construction that results in a brighter and more uniform light yield. "This development with Vuzix, the leading provider of next-generation augmented reality glasses, is a significant endorsement of Plessey's GaN-on-silicon microLED approach," said Keith Strickland, chief technology officer at Plessey. "Monolithic microLED technology is fast emerging as the only one that can provide high luminance in a very small form factor with minimal energy consumption, necessary for reducing costs and enabling lightweight battery-powered products for a range of emerging consumer and industrial applications." Between the company's two announcements this week, Vuzix is hitting most of the pain points that the augmented reality wearables industry faces in producing devices that are attractive to consumers. With a sleeker design, longer battery life, better performance, and a lower cost, Vuzix is taking a big step forward towards that tipping point from enterprise utility to mainstream appeal.